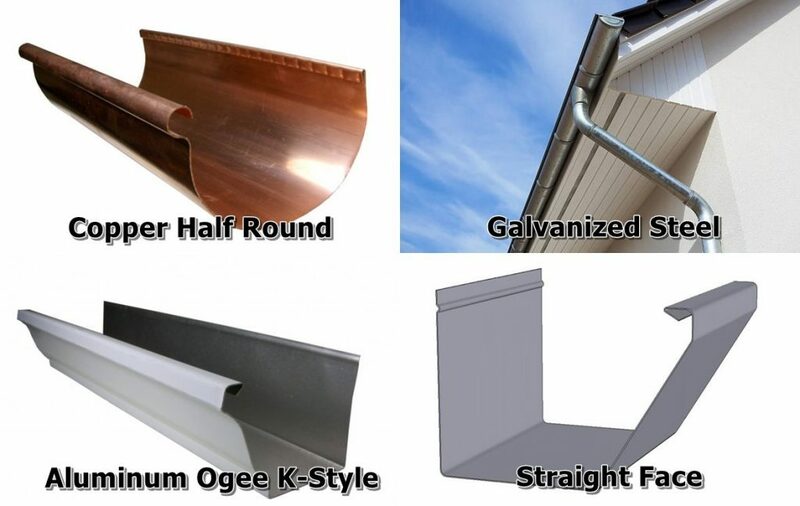 When choosing what you want for your new gutter system, you have a variety of materials from which to select. Some of the more popular choices include aluminum, galvanized steel, copper, vinyl, and wood. And then there are so many other variables to choose from. So this rain gutter selection guide will help you make all the best choices for you. Aluminum is the most popular gutter material on the market because it is relatively inexpensive, durable, and you can paint to match the color of your house. this metal will not rust so it holds up for a long time. Besides being able to paint it, aluminum gutters come in a wide range of colors. So that way you won’t have to paint them if you don’t want to. Steel gutter systems are usually galvanized, although stainless steel options exist as well. At AAA Pro 1 Rain Gutters we only carry Galvanized Steel. Galvanized steel gutters will eventually rust after 20-25 years. In contrast to its life span it’s a great choice based on its strength. Since steel is strong and durable it’s a popular option for areas that experience heavy weather or risk a possibility of heavy objects coming into contact with them. Ladders frequently leaning against them. Big trees surrounding house, so risk of broken branches falling. Basketball or volleyball courts nearby. One fly ball will damage a weaker gutter really fast. 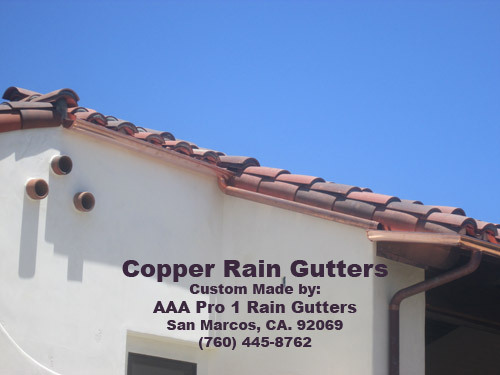 Copper is one of the more upscale gutter options. It brings a certain look of prestige and nautical elegance to a home’s curb appeal. Also worth noting is that copper is a good choice for coastal homes. Partly because of the nautical theme. But also because they don’t rust like steel. And the coastal salty air is really tough on all types of metal. That why copper is a metal of choice for boats. When you are aware of the copper patina then you won’t be surprised as it changes color over time. 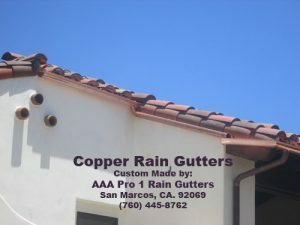 A copper gutter system will only stay shiny for the first month or two. Afterwards it will eventually turn brown or maybe a greenish color. Vinyl is a cheap gutter option. From a DIY homeowner’s perspective it is very easy to cut and work with. You can find vinyl gutter systems in big box home stores (such as Home Depot or Lowes). There are 3 big down sides to vinyl gutters. Vinyl tends to become brittle and break due to extreme cold and extreme heat. It is not as sturdy or durable as metal gutters. They are not seamless. They come in pre-cut sections so seams are a requirement. We at AAA Pro 1 do not recommend vinyl gutters. We do sell nor install them because of their inherent low quality problems. Wood is a unique choice. Best for log cabins and any other type of structure that features a wood theme in construction or decoration. Wood is a beautiful material to work with. But as you know wood is a soft material. So it is prone to warping, chipping, breaking and other damage. Since wood comes with lots of issues we do not recommend it for just any application. As such, we do not make or install wood gutters. A smaller K-style gutter will drain the same amount of water as a larger half-round gutter. 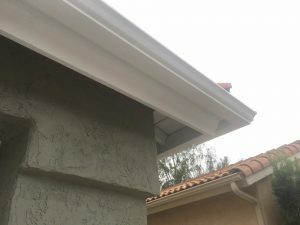 Half-round (also called U-shape) gutters are a traditional shape because it was the original gutter shape dating back to the early 1900’s and earlier. K-style and straight face gutters became mainstream options around the 1950s. Downspouts typically come in round or rectangular. We feature the rectangle shape as our main choice because of its reliable structural integrity. And its appearance seems to fit just about every application quite nicely. When it comes to size, a homeowner will have to choose from gutter size (the measurement of the top opening), downspout size (length and width or diameter), and thickness. The most common gutter sizes are 4 inch, 5 inch, and 6 inches. 4 inch gutters is not a choice that we support because it’s too small for most roofs. We recommend 6 inch gutters for best water flow and strength. Downspouts are commonly 2 x 3 inches and 3 x 4 inches in diameter. When determining the size of a home’s gutter system, a homeowner should consider the area’s rainfall. A home that sees a lot of rain or has a steep roof pitch should have a larger gutter system. Similarly, a home surrounded by tall trees will need a larger system to accommodate falling leaves without clogging. This is why we recommend 6 inch gutters. Thickness is rated differently, depending on the material used. A thicker gutter system will be sturdier, more durable, and more expensive. Aluminum systems range from .019 to .032 inches in thickness. Copper is usually rated in weight, with a heavier weight indicating greater thickness. It is common to see 16-ounce and 20-ounce options for copper systems. Steel is the thickest metal and may be rated in inch-thickness or gauge. A homeowner will have to decide between gutter sections or a seamless gutter system. Some gutter systems come in sections that are fit together, thus leaving seams. Today’s aluminum sectional systems require gutter sealant at the seams to prevent leaking. It works for a while but needs resealing at frequently intervals. Sectional copper or steel systems are actually soldered together at the seams, eliminating the need for sealant. Proper installation of a sectional copper or steel system should include soldering, although some installers will use a metal sealant. In contrast seamless gutters require professional installers. In a seamless system, an installer will use a special machine on-site to form long stretches of gutter (usually copper or aluminum) that will run the length of the roof-line without a seam. 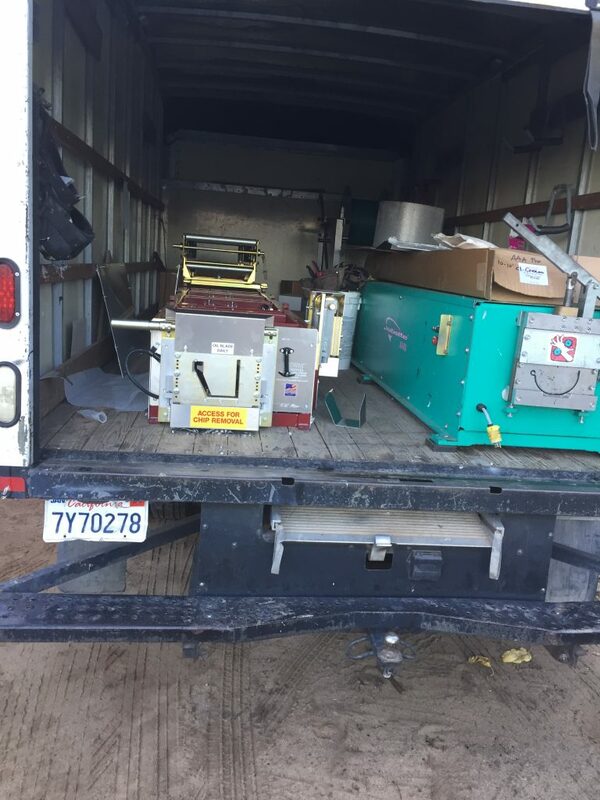 We have these gutter forming machines in our vans. And we only install seamless systems because of their many benefits. 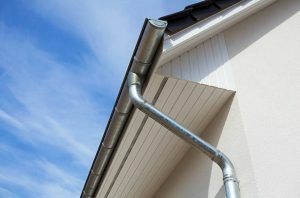 Gutter installation should follow a couple basic rules. Gutters must be pitched so water will flow to the downspouts. The rule of thumb for this slope is a vertical 1/2 inch for every 10 feet of horizontal run. If the run is more than 35 feet long, we recommend installing the high point of the system in the middle. And then we angle the gutter downward in both directions to downspouts on both ends of the run. It is very important to direct water from the downspouts away from the building or structure. This rain gutter selection guide would not be complete without including gutter additions! 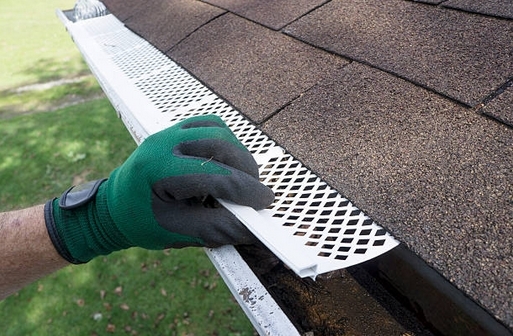 Gutter screens and leaf guards help to keep foreign objects out of the gutters. When considering such accessories, homeowners will want to evaluate the types of debris that may land on or in their gutter. You’d be surprised what we find clogging gutters and downspouts. Common finds are tree parts and other foliage debris. But also sporting equipment (baseballs, Frisbees, gold balls, Nerf darts, other toys, etc.) and sometimes (sadly) even dead animals. So it’s best to put guards over the gutters to keep out possible obstructions. Additionally, homeowners may look into splash blocks on the ground that guides water away from the foundation. 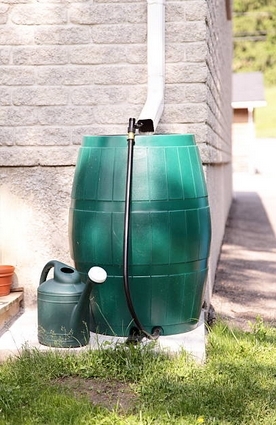 Some people prefer to collect rain water in barrels and use it wherever they want. Another popular trend is a rock bed style water way. It looks nice when dry and then becomes a babbling brook when it rains. This water stream guides the water away from the house in a unique and attractive way. We sell and install gutter guards and gutter screens. But not the rain water collection barrels or rocky stream beds. However we can install downspouts that direct into these areas if you have them. If you have questions about our rain gutter selection guide article then please ask us! We’re always happy to help. And course, price quotes are always free too. Serving all San Diego and North San Diego County.